Contrary to what the title may suggest, I am not doing character picturings. This is more of a picturing free-for-all thread, where anyone can request picturings, and anyone can give them—but for OCs. Here’s a basic sheet. Feel free to use your own or add to it. And I think that just about covers it. We’ll see how this goes! ooh!!! I’ve never joined a picturings thread!!! Appearance: they have a dark grey plague doctor mask on, and black hair that’s bleached on the ends. Has a maroon and light grey sweater, with blue jeans. Basic personality: quiet, and cheerful around friends. 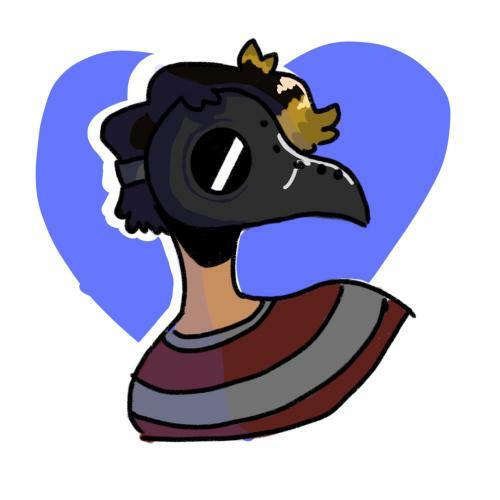 Here’s a bust of them I drew! Gott, I love your art style. Super unique. @Artimerrx, that's an amazing drawing! I'm working on drawing your OC now. Here's an OC of mine that needs developing. I might post one of the other characters from the book she's from later. Perceived Age: I'm not sure... she doesn't know her age really. I'd say she's about 16-ish? Species/Race: She's Asian-American, I believe. Appearance: She has long tangled black hair and blue eyes. She wears a torn white shirt with red Japanese lettering on it and black leggings. Her arms are metal. Basic Personality: She's sensible and cautious. She's good at coming up with plans, though she often leaves the planning to other people because she's anxious that her plans won't work. She's very smart, but tends to keep to herself. She's also pretty good at creating peace between the other people she's currently working with. Likes/Dislikes: She likes helping people. She's a good leader, but I'm not sure yet if she likes leading people or not. (I just introduced her to my book so I haven't developed her very much yet) She also enjoys working with machinery/tinkering with her metal arms. Background: In the book she's from, there's a secret organization that experiments on people and gives them robotic parts (based slightly off of Lucy B/aFountainPen's Bionics RP). Seeker was one of the organization's victims, which is how she got her metal arms. Thanks to the organization's experiments on her, she doesn't really know a lot about her past. Other: She has minor healing powers from her arms, since they were originally for a healing robot. Woah, cool character AW! I'm totally doing her once I get back to HK. What exactly is an OC? I think it stands for Original Character, one that you create yourself. But I'm not sure if it has a different or more specific meaning on Chatterbox. Someone else will probably help us out.